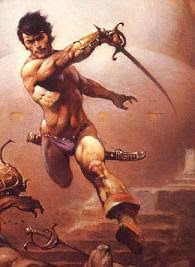 Given the prominence given to Barsoom in the LBBs and how much of Appendix N is taken up by books in which 20th century Earthmen find themselves transported to fantasy worlds, it's amazing to me that it's never been formally included into any edition of Dungeons & Dragons. Here's my initial pass at a Labyrinth Lord-style character class based on this premise. The entirety of this class is hereby designated as Open Game Content via the Open Game License. As their name implies, Strangers are human beings from another world/time/dimension, who are trying to make a life for themselves as best they can in their new homes. Despite their otherworldly origins, Strangers possess preternatural adaptability, being able to learn local customs and languages with surprising ease. Consequently, Strangers may learn the local equivalent of Common within hours of first hearing it, regardless of their INT score. Similarly, they suffer no reaction penalties when dealing with alien species/cultures. Indeed, many Strangers find themselves looked upon as long-sought heroes and liberators, whose mysterious arrival portends revolutionary changes in the status quo. Unsurprisingly, Strangers find allies and enemies in equal number. Perhaps because journeys between worlds/times/dimensions are inherently hazardous, only the most resilient -- and fortunate -- Strangers survive. Members of this class use the same saving throw charts as Fighters but gain a +4 bonus. Owing to the unusual nature of their fighting styles, Strangers gain a +1 bonus either to Armor Class or to hit and damage when fighting opponents unfamiliar with their ways. Which bonus the Stranger wishes to use must be declared before each combat begins and, should the opponent survive to face the character again, the bonus is nullified thereafter in the case of that particular foe. Awesome class! This would be vary useful for fresh players who are new to the game (being more forgiving then the Fighter class), or any other players who are learning an strange and unusual setting as they go along. I have used this archetype in the past to introduce new players to my own version of Gamma World. I was thinking of doing the same with with Carcosa. People would be surprised by this class goes beyond John Carter of Barsoom: Holger Carlsen (from Three Hearts and Three Lions), Carson Napier of Amtor (Venus), Tangor of Poloda (Beyond the Farthest Star), Esau Cairn of Almuric, Maskull of Arcturus, Tarl Cabot of Gor, Den of Neverwhere (Heavy Metal), Myles Cabot: The Radio Man, Jandar of Callisto, Dray Prescot of Kregen, and so on. No level titles, James? For shame! Arthur: Sadly, Labyrinth Lord doesn't use level titles. James: Excellent class. I would never have thought of such a thing but now I realize I was desperately needing it! Looks like you hit this one out of the part, James. :-D Nice work. Really lovely. I was skeptical about there being a recognizable, unified essence/archetype there, that would pull together Carter, Dale Arden and Dr. Zarkov, but you found it. And I'm going to adapt it for my next dimension-hopping Flashesque game. Amazing how simple the concept and how long it's taken anyone to put it together the way you did, James. Good one James...been on my semi-todo list forever. And I think this would adapt to any race as class old school game not just LL. Does this class otherwise function as a fighter for purposes of unspecified things like allowed weapons, armor, and the place on the to hit chart? you will be GLAD to know THAT Pixar has a John Carter Movie in the works . . . Yes, my intention was that Strangers could use all the same weapons and armor available to fighters. I should probably specify that in my next pass for the class. here is the quote . . .
“Time and again the ferocious apes sprang in to close with us, and time and again we beat them back with our swords. The great tails of the plant men lashed with tremendous power about us as they charged from various directions or sprang with the agility of greyhounds above our heads, but every attack met a gleaming blade in sword hands that been reputed for twenty years to be the best that Mars had ever known; for Tars Tarkas and John Carter were names that the fighting men of this world of warriors loved best to speak. Yay! When do the Thark arrive? I'm putting together a "Green Savage" class as we speak. I'll post it later today or tomorrow. Clovis, that reminds me, it's Disney, not Pixar. Read on. But I AM glad that that they're finally making the series! So, it's essentially the same as the Fighter...? And a new class is needed why? WHere did you get the purple undie pic? Yikes. I'm hoping this is a joke. It's a Frank Frazetta piece. Do you think--via the literature, that they would classify as being able to use the "use magic device/scroll" ability that thieves get? It always struck me as odd that D&D never had this either. I doubt it'll ever come about for my current system of choice, but I can always hope. My understanding was that the original D&D classes came about because players in campaigns wanted them. That being said, does someone in your Dwimmermount campaign want this character, James, or is this more of a thought experiment? And how on earth did you land on 2,187 as the multiplier? Why not round it to 2,200? @UWS Guy: that's probably not a bad addition, perhaps not as expansive though. If they brought a chain-saw with them and somehow lost their hand in a fight with a demon-witch in a pit, could they graft it to their forearms? 2nd question--this time serious: Since they gain no new abilities at certain levels (I'm assuming this is 1E). What's to stop them from dual classing once they arrive? Wouldn't it be tempting to dual class to fighter or thief since all abilities are granted at level 1 with the traveler? The class is (mostly) theoretical at the moment. Its lack is a minor obsession of mine, actually, and it may come in handy in the near-ish future. As for dual-classing, there's no such thing in Labyrinth Lord or most other OD&D-derived games. Those are the games for which I designed it. As for the odd XP chart, it's derived from the Dwarf's chart in Labyrinth Lord, which uses such numbers to avoid "artistic presentation" issues. ya'll did get the "evil dead" reference right?...I can't be too sure how hip some of you elder grognards can be, what with all your edger rice burroughs and whatnot. I like the concept overall and I think it's a neat addition, but I wonder if a +4 bonus to saves isn't a bit much. +4 to saves is modeled on the dwarf and halfling racial classes, neither of which really seem all that powerful in play. Do you recommend a lower bonus then? This class is cool enough that I have decided to use it in my about-to-start LL Wilderlands PBEM, "Barbarians of the Wilderlands"! Here's my intro for bringing Strangers to the Wilderlands - suitably pulpy I hope! "The energy read-outs are green, Dr Weissmuller"
The short, balding man in white lab coat, spectacles and moustache looked up at the beautiful young brunette bending over the read-out VDU. He turned to the curvaceous Scandinavian blonde stationed at a second screen. "Dr Espen, how is coil integrity?" The blonde looked up and nodded. "Integrity is good, Dr Weismuller." Weissmuller turned from the screens to survey the assembled gaggle of scientists. "Ladies and Gentlemen. Today we make history!" GM OOC: Am accepting applications for Stranger PCs, part of Dr Weissmuller's team. These may replace already submitted PCs - I'll keep those as back-up/replacement characters. My current plan is to finalise PC selection on Tuesday. I am likely to start with 3-4 PCs, probably bringing in more later as the game develops. Ah. I guess I would have just said "Use dwarf/halfling saves." Much of a muchness, I suppose. I am glad to see revival of interest in ERB’s works, back in 1990 , I copy righted Red Planet, a RPG based upon Barsoom. Because of the OSR, I am rewriting this game with RETRO mechanics. I write under a name de plume; in real life I am a board certified neurologist, who is an accomplished equestrian and avid shooter. If I am able to find an affordable and reliable artist, I will send a proof copy your way . . .